BOISE – The Gonzaga Bulldogs knew they were in for a fight against Ohio State. 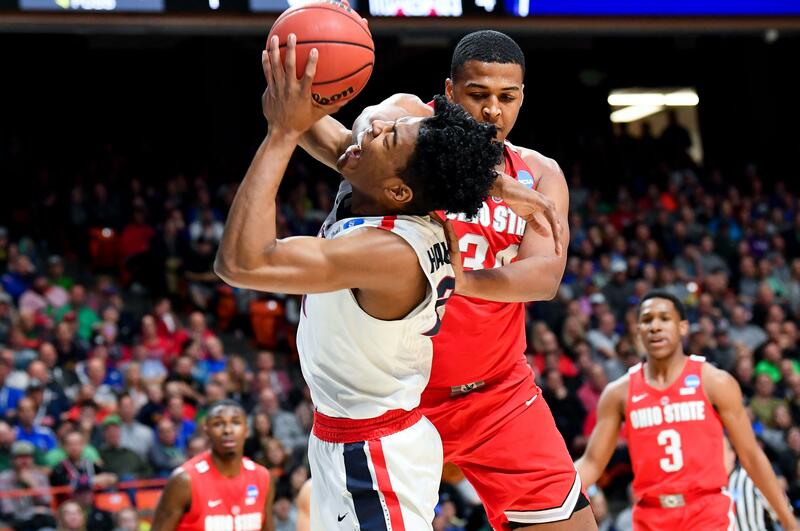 After Gonzaga’s 27-point win over Ohio State at the PK80 Invitational in Portland earlier this season, the Buckeyes were looking for a brawl in their second meeting at the NCAA Tournament on Saturday. Gonzaga’s 90-84 win over Ohio State in the NCAA Tournament’s second round was expected to be a physical one after the outcome of the PK80 Invitational. The Zags had their fair share of whistles called against them in the middle of tough zone defense on both ends and a physical game that saw players flying into the sidelines. Senior forward Johnathan Williams was the first to get into foul trouble. With the Zags down by two points and 8 minutes left in the game, Williams got called for an illegal screen and was sent to the bench with four fouls. One by one, the Zags followed suit. Norvell picked up his fourth foul on a shot with 1:22 left. Tillie picked up his fourth with 46 seconds left. Guard Josh Perkins, the third starter to get into trouble, was whistled for his fourth with less than two minutes left. Perkins fouled out with 18 seconds to go on a questionable foul from just in front of the 3-point line. After attempting to block C.J. Jackson’s shot, he was given a whistle and a seat on the bench for the rest of the game. Amidst the whistle frenzy, the Zags stayed calm and looked to Norvell and sophomore forward Rui Hachimura to mitigate the damage, particularly in the frontcourt. Norvell helped keep the bigs out of too much trouble under the hoop with 12 rebounds, four on the offensive end. Hachimura, who took over for Williams midway through the second half, added 10 of his 25 points in those final minutes, including five at the line. He stayed physical inside and issued his fourth block of the night on forward Keita Bates-Diop’s attempt at the rim. Perkins said Norvell and the rest of the bench did well at stepping in and taking some of the hits down the stretch. Published: March 17, 2018, 9:48 p.m. Updated: March 17, 2018, 11:46 p.m.